For an updated write-up of this interview, see 6 Content Ideas Every Marketer Should Steal From IBM. Scott Abel and I recently interviewed Andrea Ames about the business value of intelligent content in the enterprise as well as the value that IBM places on intelligent content. With over 30 years in technical communication to her credit, Andrea — a familiar presence on stage at many content-related conferences — is IBM’s Enterprise Content Experience Strategist, Architect, and Designer. Andrea and her team report to IBM’s director for enterprise content. Not marketing content. Not engineering content. Not any one department’s content. Enterprise content. This team answers, ultimately, to the chief information officer. Their mission encompasses every part of the organization and every kind of content — internal and external, presales and postsales, technical and marketing, strategy and enablement, content experience, and content technology. However you think about corporate content, this team owns the mission for it. 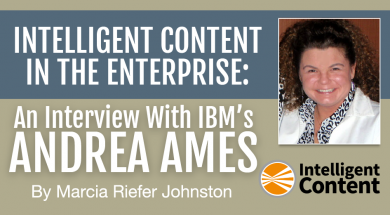 Here’s what Andrea has to say about why intelligent content is big in the enterprise — and why IBM and other companies, big or small, are thinking about it. And if they’re not, why they should be. How do you define intelligent content? ANDREA: My mom and my sister have asked me this. I tell them that intelligent content is consistent in structure. More than that, the titles, paragraphs, numbered lists, and so on, are identified in such a way that not only people but also machines — computers — can recognize what those elements are. Intelligent content includes other data, too — metadata, information about the content, like what kind of content it is, what department it belongs to, who created it, who needs to be able to see it. It’s data that a machine can read so that the content can be managed and delivered appropriately, based on the creator’s intent. The cool part is that applications can be written based on the data built around that content. If we attach the right information to the content, machines can understand the context for that content, like who’s supposed to receive it and when. For example, we might want to say, “Give me all the content that’s intended for cooks, and pull it together into a cookbook.” A machine can go get all the pieces of content tagged for cooks. That’s a simplistic example. But look at it on a greater scale. Take a company like IBM. We might have 60 or 70 personas that we develop content experiences for. We want to deliver information that’s relevant and, to an extent, personalized. We don’t want to deliver administrator information to a developer. We don’t want people to have to sift through 50 million things to find the five things they care about. Why should a marketer go to all that trouble? ANDREA: People on the technical side may be ahead of the game when it comes to intelligent content because we’re geeky, but making content intelligent is even more important when it comes to marketing. Marketing is about building relationships. The idea of intelligent content is critical to that idea of building relationships. Let’s say you want to send out an invitation to an event your company is hosting. You wouldn’t want to send it to the people who have already agreed to be panelists for that event. Why does customizing matter? We’ve learned that technology buyers’ engagement with content encompasses 56% of the sales cycle versus 21% talking with salespeople. When you realize that content has a bigger relationship-building potential than talking to a person, that’s huge. Your content is your sales opportunity. Not only that, but these people who are reading your content aren’t researching just for themselves. They curate it. They share it with executives, who send it out to their evaluation teams. Your readers are influencers. I want to say one more thing about relationships and why it’s so important for marketers to think about this aspect of their content. In the buyer’s journey, you have the presales phase and the postsales phase. We also have a phase we call advocacy. You don’t get to advocacy unless customers feel like they have a relationship with you, your company, your software, your hardware, your woodworking patterns, your cookbook, whatever it is. You’re not going to have someone writing a blog post saying, “That was the best cookbook I ever read” or “IBM software is the bomb” — you’re not going to get that level of advocacy unless you have a relationship. And you don’t get a relationship by saying, “Hello, IBM customer. How do you like your product? Please go to this online survey.” We know who they are. We know what they bought. If we make our content intelligent, we can target the discussion so that they feel like we know who they are. So why should marketers take an interest in intelligent content? Customer relationships. The folks in marketing have an even more business-impactful use case for intelligent content than the technical, geeky people who have been doing this for a while. The good news is, we can help each other. What does intelligent content make possible that IBM couldn’t otherwise do? ANDREA: Intelligent content enables us to deliver highly relevant content on a massive scale, especially since we’re looking at a lot of content and a lot of content creators and strategists. Even for a small company with only one person thinking about strategy questions — like what content they should deliver to whom and when and where — if that person has 10,000 chunks of content to worry about, that’s a massive scale, too. Companies might think that this is all too much to ask. But they have to face up to their customers’ expectations. Consider my nephew and me. I’m about twice his age, and I have high expectations of content. My nephew is 23, and he’s much less tolerant of “Hi user, please take our survey.” He takes for granted the Amazon plus-plus-plus kind of experience, where the company knows what he’s interested in and is even willing to give him free stuff based on his interests. To get that kind of experience, he’s willing to share information about himself. We have a whole bunch of people, the 35-and-unders, who are, by and large, willing to give up a whole bunch of information to get this personalized experience — they expect to do that. From a marketing perspective, that’s pure gold. This reality of expectations is driving companies toward intelligent content as a requirement. How do you sell the value of intelligent content to management? ANDREA: I suggest scooping up some of the industry success data that’s available. One of the best ways to find it is to go to a conference like the Intelligent Content Conference and learn from people who are sharing their stories. Go to the case-study sessions, where people say, “We did x, y, z. This is how it turned out.” You’ll get ideas for what might work for you — and ideas for what not to do. There are also a lot of webinars and information available for free, of course, but there’s nothing like a conference to bring together a lot of these stories across all kinds of companies. If you divide the cost by the number of sessions you attend, it’s a small price for the richness you take away. I can’t say enough about the value you can get from going to a conference, especially one like ICC, which brings technical people and marketing people together. I think it’s a perfect marriage. Here’s another thing I suggest. Try a small project. Measure its results. Prove that it works, and sell the business impact to your executives. For this approach to work, you have to go to the execs first, especially the marketing execs, and find out what’s driving them, what’s keeping them up at night. What are their biggest issues and biggest goals? You’ll hear a lot about customer relationships, getting customers to advocacy, selling more, obviously. Based on those conversations, you can tie their goals and concerns to implementing intelligent content. Does this executive want to build more one-on-one customer relationships? Good. Look into what that takes. Present your ideas and results in terms that this executive can relate to. How are your content systems set up to create, store, and manage information across the whole company? ANDREA: Like other companies, IBM uses a variety of systems. If you go to IBM.com, for example, you’ll see that we have lots of channels. We have IBM Knowledge Center for documentation. We have an e-support portal. We have DeveloperWorks. The same impetus that creates those channels also creates the various back-end systems that manage that content. Internally, we also have multiple systems. It’s inevitable because we acquire a number of companies every year, sometimes many acquisitions in a single division. So we end up with various content management systems and authoring tools. My director’s team owns the strategy and enablement for all these systems. As groups encounter issues and needs, they come to us to talk through the content-experience issues (which my portion of my director’s team focuses on), and they talk through the content-technology issues (handled by my counterpart Michael Priestley, the content-technology strategist, and the rest of my director’s team). My team provides the requirements for the experience, and the rest of the team handles the technology strategy. Michael holds the vision for how we deal with all these systems. IBM has the same problems that most companies have. For example, marketing information might live in one system while technical documentation lives in another system. The systems might sync up or give a virtual view of multiple repositories that make it look like there’s a single repository – or they might not. It depends on what part of the business you’re in, whether you were recently acquired, and so on. It’s a complex problem. It takes a lot to get your brain around this stuff at any company. In a large enterprise like IBM, the problem is bigger by orders of magnitude. It can seem overwhelming. It’s also fascinating. Here’s the thing. You can’t avoid this problem. This is the reality of the information-systems world we all work in. These issues have been around with data for a long time. When you acquire a company, suddenly you have two employee databases and two customer databases. How do you get all that information together? How do you get your brick-and-mortar business and your web-based business together? In the early days of e-commerce, you’d walk into a brick-and-mortar bookstore, and they probably didn’t have your name and address the same as on their website. So the kind of back-end issues we’re talking about have been around for many years for people managing data. In the collection of concerns in today’s chief information office, content is a similar concern. What example can you give to show that intelligent content is worth the hassle? ANDREA: Using intelligent-content strategies, companies can have significant wins. For example, early in my career at IBM, we looked at what it cost the company for a single support call, and we looked at the technical documentation, and we asked, “How can we deliver the information people need in a more timely and relevant way so that they’ll be less inclined to pick up the phone?” We wanted customers to have the content they needed right in front of them when they needed it. By doing some simple things — like reorganizing our navigation around user tasks, adding some instructions directly to the user interface, and using metadata to improve people’s search results — we estimated that we could reduce our problem reports by 10%. By the end of the year for the one product we looked at, a successful effort could pay someone’s salary a few times over. That was just by doing three or four seemingly small things. The more you can automate those sorts of things, letting machines do what they do best, the more impact the content will have, which could translate to more content professionals’ salaries you can pay. Andrea’s insights help me in several ways. For one thing, I feel more clear now than ever as to what intelligent content is: content that works both on and under the surface. Content on the surface. Here, we find the stuff that humans must understand, like text and images. Here, the content has to work for the audience. This is the realm called editorial. Content strategists and content creators decide what to say, how much to say, what voice and tone to use, what terms to choose, what examples to give, etc. Content under the surface. Here, we find the stuff that machines must understand, like metadata. Here, the content has to work for computers. This is the realm called intelligent. Computers are the silent engines of intelligence. When set up to do so, they can direct the right content to the right person at the right time at the right place in the right format in the right language on the right device. If the thought of delving below the surface of content seems daunting to you, you may find it reassuring, as I do, to hear Andrea say that even IBM doesn’t have it all figured out. The thing to do is start small. Try something that might make a difference. Learn from it. In other words, you don’t have to know how to swim to dip in a toe. What’s stopping you from doing that? Want more on intelligent content? Sign up for the Intelligent Content weekly email newsletter. When you do, every Saturday we’ll send you an email pointing to that week’s articles on the Intelligent Content blog. Each Saturday email includes an exclusive letter from Robert Rose, Chief Strategy Officer for the Content Marketing Institute. Also register for this June 24 webinar: Critical Content: Adapting Your Processes and Content for Global Markets. Andrea (@aames) is Senior Technical Staff Member and Content Experience Strategist, Architect, and Designer on IBM’s corporate information strategy team, where she enables the strategic use of IBM’s content assets for client delight and success as well as IBM business impact. Among other distinctions, Andrea is a Fellow and past President (2004–05) of STC, a Distinguished Engineer of the ACM, and a Senior Member of the IEEE. She designed, coordinates, and teaches in the UCSC Silicon Valley certificate program in Technical Communication. She has published two award-winning technical books and numerous papers and articles, and she speaks regularly at conferences and professional organization meetings. She has been known to spontaneously don a red power cape.